Unfortunately, I ride a road bike (specifically a Kona Dew), so I have much smaller, thinner road bike tires. Is there any type of tire I can get that is resistant to goathead thorns? 1 aka Tribulus terrestris, puncturevine, caltrop, cathead, yellow vine, goathead, burra gokharu and bindii. I switched to using Specialized Armadillo a while ago because of frequent punctures, and I haven't had any since making the switch. I'd highly recommend them. I haven't tried them specifically with goatheads, but I've run through nails, staples, glass and just about anything else you could find in an urban environment on Schwalbe Marathon Plus ("flat-less") tires. I have never had a flat over thousands of miles with their Marathon Supremes, either--and they're much lighter and better riding--but they're not as puncture-proof as the Marathon Plus tires. Neither I, nor anyone in the group of hundreds of cyclists on a local Seattle mailing list have ever seen anything more puncture proof than the Marathon Plus tires. Product listing from Schwalbe North America (distributor for North America). They're available in a wide range of sizes. Just about any tire is going to be vulnerable to punctures especially as they age/wear. I've found the Continental Gatorskin tires to be effective and I match them with Mr. Tuffy tire inserts. As long as I check the tires for embedded thorns/glass every few weeks, I can go a few thousand road miles or more without a flat. The downside of using inserts and thicker tires is the weight increase. To me, this is negligible and well worth the decrease in flats. You can run Slime in your tubes to seal any punctures from those goat heads as well. You could also avoid using tubes and switch over to a tubeless system, which some of my friends have had great successes of using, in terms of reducing punctures. There are many options available to help reduce the likelihood a chance encounter with goathead thorns will interrupt or end your ride for the day. Not all of these options involve replacing your tires. Use Puncture Resistant/flat-resistant Clincher Tires such as Specialized Armadillo or Continental X-King ProTection. Pros: Widely available, no special tools/equipment/supplies needed to install if using puncture resistant clinchers. Some types of puncture resistant tires have very long wearing treads. Cons: Puncture resistant clinchers can be difficult to change when you do get a flat, can have relatively higher tire weights and are sometimes less flexible and/or harder than normal clinchers. Less effective against side-wall penetration than against tread penetration, but usually still better than conventional tires. Pros: Normally a pretty in-expensive option. Cons: Added weight, additional difficulty changing tires, can reduce the flexibility of the tire resulting in a rougher ride. Provides only limited side-wall penetrations. Pros: Can be very good at stopping leaks from simple punctures. Allows the user to use whatever type of tire they wish and doesn't harm the flexibility of the tires like some other options do. Cons: You may have to periodically replenish the sealant, it adds weight, some types of sealants form balls of gunk as they dry up, can sometimes gum up the valve, can partially glue the tube to the tire in the event of punctures and if the tube fails for some reason it can create a real mess. Depending on the type of sealant, can be hard to install in tubes without removable cores. Pros: Lighter weight (even with sealant) than some of the other options. Depending on the tire selected you can find very flexible/grippy tires. Almost eliminates the likelihood of pinch flats. There are tubeless tires available with addition flat protection that still retain a high degree of flexibility such as the Schwalbe Nobby Nic's Evolution with SnakeSkin or Double Defense. Cons: Requires specialized wheel-sets and/or rimstrips and valves. Requires you run sealant. Tires can be hard to mount initially and if not using UST compatible rims and tires an air compressor may even be required to get the tires to seat. Multiple punctures can release enough air before holes seal the tire becomes susceptible to burping. If this happens it can be hard to reseal the tire in the field. If you are on a longer trip you still need to carry spare tubes in the event the tire gets a large cut or burps so much the tire becomes unseated. The sealant can create a mess when you have to install a tube in the field. True tubeless/tubeless ready tires tend to be more expensive than normal clinchers. Pros: A relatively inexpensive option. Allows use with any type of clincher tire. Can be combined with sealants for additional protection. Simple installation. Pros: No air to leak out of the tire and cause a flat. Cons: less/little flexibility results in less traction and a harsher ride, depending on the exact type, may be more possibility for rim damage when hitting obstructions as the tire is more likely to transmit the shock than absorb it. Are very heavy compared to other options. I buy the puncture-resistant tubes and don't have any flats. They're the same price as regular tubes and work as well with regular tires as regular tubes with gator skins or the other puncture resistant tires. This is a cheaper, and in my opinion, better way to go. The other advantage with buying a tougher tube vs. a tougher tire is you can still ride a supple tire. The gator skins or armadillos are really hard and don't provide as good a ride. On my touring bike I have ridden over 25,000 miles of commuting, training, and touring, with seldom a puncture. I have used Continental Top Touring 2000 tyres, and more recently Vittoria Randonneur City tyres, both in 28mm width, and I find their puncture resistance excellent. We recently had an horrendous experience with goatheads. Naive perhaps but took to a country area that had flooding. The local bike shop installed thorn resistent tubes (yeah think ones) plus some "green slime" that was silsicon based that would autoseal any puctures. Our tyres look exactly as per the image and we needed pliers to remove the thorns. Took the bikes out again in the same area (whole region covered post floods) and was able to remove the goatheads manually from the tyres and the pressue was maintained - even 4 weeks later. Original tubes defalted after one hour of ride. Cost me $25 a tyre including fitting (on holiday so no options). Oh and we had mountain bikes, but the bike shop chap assured me that the "slime" was good for all tyres. You can't prevent the puncture so much as prevent the resultant air leakage. They ride like lower pressure tires, alas. But with thorns like those, best of luck with anything else. Gives an extra layer of protection stopping the thorn from penetrating the inner tube. It also happens to be a whole lot cheaper then most other solutions (you've already paid for it) and without the problems of something like gel. I rode 5,000+ miles this summer (bike centennial route from VA to OR) with no flats on one pair of Vittoria Randonneur (700 x 28) tires. Very impressed and the front tire still looks brand new. I'll probably replace the rear tire pretty soon, but it was a trooper too (all of the weight for my touring bike was on the rear wheel)! I rode a bike in Bullhead City, Arizona (named after the tremendous amount of goatheads) for about four and a half months. I pulled at least that many out of my tires every day or every other day. Liquid sealants like Slime or similar were the more affordable, but more tedious, solution. Still, it was a lifesaver when I was miles away from water sources. Not the answer you're looking for? Browse other questions tagged tire mountain-bike product-rec puncture innertube or ask your own question. Whatever happened to solid bike tubes? What is a good way to keep my tires from going flat easily? Do Kevlar Belts really offer puncture protection? How do I stop punctures for good? Am I too heavy for my road bike tires? What makes one road tire have a less “bouncy” ride than another? Tires for 28' city bike (622x19C) to reduce rolling resistance? Significant difference between 28C and 32C tires? What is a cheap puncture-proof tire against tackweed? How much can a 700x23 inner tube stretch? 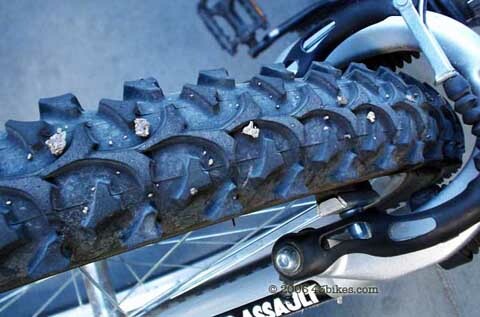 Anyone using studded bike tires on a commuter in milder climates?